100% cotton. Price is per metre. Hot pink background with darker pink stripes to form a check. 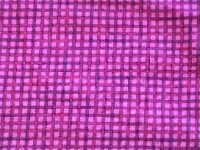 The darker pink stripes have little smudges of black dots at various places along the stripe.The Centre of the check (the paler hot pink section) is 5cm, 1 full pattern (hot pink centre plus one dark pink stripe) measures 1 cm. Candy Brights by SSI Studio.